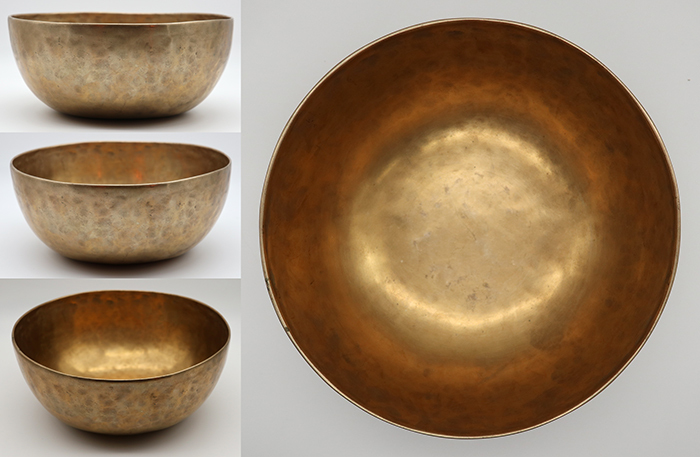 This 9 ½” Antique Jambati Singing Bowl has been expertly forged and has ultra-fine walls that make it light for its size, and therefore comfortable to hold and play for an extended period. The fundamental note is an exceptionally low perfect pitch second octave F (88Hz) that flickers towards F#2 (90Hz) when struck with a padded mallet. The rim note is a middle C (258Hz) harmonic when played with a suede or wooden ringer. This bowl’s fine walls create lots of vibrant energy that enable it to produce splashy fountains when played around the rim with water inside. It has seen a lot of use in its lifetime, has very smooth walls, and the decorative circles at its centre have been virtually worn away over the years. Nonetheless it is structurally sound, clean and blemish free, with a bright golden bronze colour.